'I Loved You At Your Darkest' Behemoth hooded sweatshirt with zip and pockets (high zipper type). 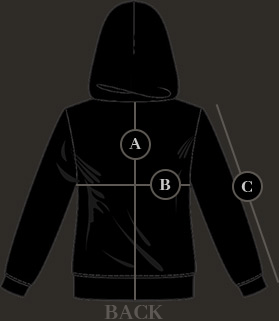 Print on both sides (Trivmviratvs sigil on the back), hood and sleeves. A Premium Quality hoodie. It has been made in Poland especially for Behemoth and it's quality and durability is far much better than most of the other hoodies present on the market. Behemoth The Unholy Trinity sigil on the zipper. Such amazing quality. From the material used, the thickness, and even the zipper, everything about this is amazing. I wore it to the Behemoth show in Toronto on 6/11/18 and Nergal complimented it and said it was really nice and looked good on me. The official Behemoth Webstore has the best Behemoth merchandise. I love this hoodie and it is very warm!